Our talented stylists offer everything from modern style to classic designs to ensure you look your best. Schedule your new look today. See what our clients are saying and see our before and after photos. 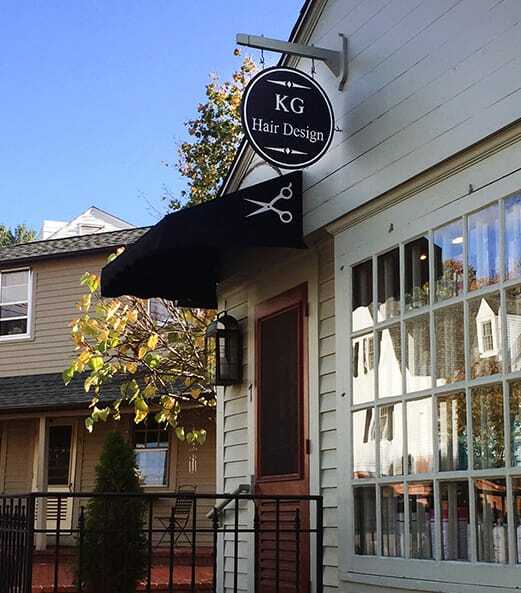 KG Hair Design is a charming hair salon dedicated to personalized service located in the heart of historic Farmington, CT. Our talented stylists offer the latest hair services with a great selection of Goldwell hair products. Owner and head stylist, Kate Giaver has a deep understanding of hair design and is proud to offer high-qaulity, unique and creative hair care and design services to her clients. At KG Hair Design, we strive to make our clients look their absolute best. At KG Hair Design in Farmington, CT, we take pride in offering a unique combination of premium haircare & coloring products along with passionate, attentive and highly skilled stylists to ensure our clients receive the best service possible. We're committed to providing our clients with an extraordinary hair care service by creating a warm, welcoming and relaxing atmosphere, listening closely to our client's individual needs and constantly striving for uniqueness and creativity. Our talented and passionate hair stylists are committed to ongoing hair related education to acquire more knowledge, increase skills and remain at the forefront of the field. This has included advanced hair styling classes with Goldwell, Aquage, Unite, Nick Arrojo, Beth Minardi and Paul Mitchell. Continual education allows us to offer a wide array of modern and high-qaulity hair styling services including men, women and children haircuts (shampoo & blow dry/styling included), expert color services and custom styling. We also offer a range of waxing services. Please visit our services page to learn more. Or simply request an appointment online!